Dr. Robert Meier and CyberKnife® patient Mike “Bing” Crosby take to the air to discuss CyberKnife System treatments for low- to intermediate-risk prostate cancer. What is the VA Choice Program? The Veterans Choice Program is part of the Veterans Access, Choice, and Accountability Act of 2014 (VACAA). If you are already enrolled in VA health care, the Choice Program enables you to receive health care within your community, instead of waiting for a VA appointment or travelling to a VA facility. To learn more about the VACAA click here. To confirm your eligibility for VA health benefits click here. Using this program does NOT impact your existing VA health care, or any other VA benefit. It expands options for veterans seeking treatment. For more information on the VA Choice Program, click here. If you did not receive a Choice Card or if you cannot find your card, please call 1-866-606-8198 to learn more about eligibility for the Veterans Choice Program. The name of your preferred community physician. Not all physicians will be eligible to participate in the program, so if your preferred physician is not available, we may be able to recommend other physicians in your area. For information on participating CyberKnife centers and physicians, please email accesssupport@accuray.com. Find a CyberKnife® Center enrolled in VA Choice Program near you. Stereotactic body radiation therapy (SBRT) is a radiation treatment that couples a high degree of targeting accuracy with very high doses of extremely precise, externally delivered radiation, thereby maximizing the cell-killing effect on the tumor(s) while minimizing radiation-related injury in adjacent normal tissues. Compared to other radiation treatments for prostate cancer that require approximately 35–45 sessions of radiation therapy over six to nine weeks, SBRT can be completed in four to five sessions. Sessions are usually given over one to two weeks. This substantially reduced treatment timeframe is advantageous for men seeking the least amount of disruption to their daily lives. It’s not just a tagline. It’s who we are, what we do and what makes us different. Throughout our history, we’ve continually introduced important cancer treatment breakthroughs that improve outcomes for patients — from improving long-term cancer control to enhancing quality of life through treatment and into survivorship. We carry that momentum forward today, fully invested in redefining the future of cancer care. Because we believe every patient deserves the best possible treatment. The CyberKnife® System is an image-guided linear accelerator mounted on a robotic arm that is designed to deliver a very precise type of external radiation treatment known as stereotactic body radiation therapy (SBRT). It is the only radiation therapy technology that tracks tumor motion and automatically adjusts the treatment beam as natural prostate motion is detected. 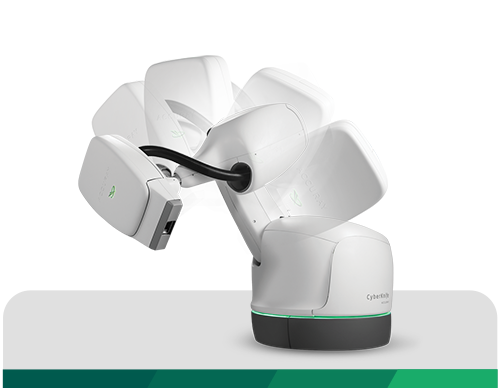 The CyberKnife System is highly precise, enabling clinicians to deliver individualized treatment with sub-millimeter accuracy through the use of continual image guidance and robotic mobility. As a result, the radiation is targeted to the prostate, minimizing exposure of healthy tissue. Using the CyberKnife System, physicians can precisely maximize dose in four to five treatment sessions, minimize side effects, and maximize patient comfort during treatment. Some CyberKnife centers already have agreements in place with the VA to treat VA patients. Others have signed up to be qualified healthcare providers through the VA Choice Program. If radiation therapy is recommended, talk with your VA primary care physician about CyberKnife. He or she can refer you to a VA contracted CyberKnife facility or Choice Program participating CyberKnife center. Multi-institutional registry for prostate cancer radiosurgery: a prospective observational clinical trial. Front Oncol, Jan. 2015. Five-Year Outcomes From a Multicenter Trial of Stereotactic Body Radiation Therapy for Low- and Intermediate-Risk Prostate Cancer. Int J Radiat Oncol Biol Phys, Oct. 2016. Stereotactic body radiotherapy for localized prostate cancer: pooled analysis from a multi-institutional consortium of prospective phase II trials. Radiother Oncol, Nov. 2013. Stereotactic body radiotherapy as treatment for organ confined low- and intermediate-risk prostate carcinoma, a 7-year study. Front Oncol, Sep. 2014. Patient-reported outcomes following steretactic body radiation therapy for clinically localized prostate cancer. Radiat Oncol, Feb. 2014. Health-Related Quality of Life After Stereotactic Body Radiation Therapy for Localized Prostate Cancer: Results from a Multi-Institutional Consortium of Prospective Trails. Int J Radiat Oncol Biol Phys, Dec. 2013. Hypofractionated sbrt versus conventionally fractionated ebrt for prostate cancer: Comparison of psa slope and nadir. Radiation oncology, Feb. 2014. Connect with Accuray to get the answers you need.